A recent NASA study links global warming to the decrease in sulfate particles in the air, because these particles reflect heat. Sulfate particles were the cause of acid rain. 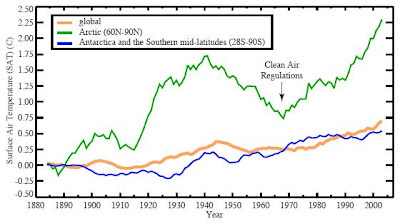 The same study, concentrating on aerosols as a cause for global warming, says a rise in sooth levels from Chinese coal, is causing a temperature rise, because sooth absorbs warmth. Last saturday the Gene Taylor trio played a fine concert in our neighbourhood pub. Gene Taylor is a great piano player, sometimes reminds me of Professor Longhair (no physical resemblance). The trio features the ever relaxed Wuff Maes on drums and Tim Hooligan on guitar. I remember fun versions of "one scotch, one bourbon, one beer", with a practical demonstration, logically followed by "Drunk" (Jimmy Liggings). They finished of taking "Jambalaya" (Hank Williams) back to New Orleans. Gene Taylor used to play with the exciting retro rock band The Blasters and is touring with the Fabulous Thunderbirds these days.